Figure 8.4. 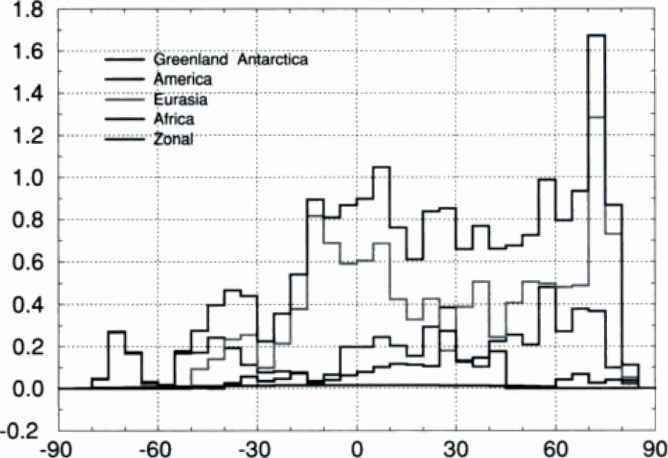 Increase in rhc size of the continents for each 5 latitudinal bands, from the South Pole to the North Pole, at the Last Glacial Maximum due to the lowering of the sea level by about 100 m, as simulated by the NSH model of Louvain-ia-Neuve (Dutrieux, 1997). See also color plate section. 8 over Greenland, and 32 over Antarctica, which is 5.7 x 10* km* of ice more than if the sea level is kept fixed. The accompanying sea level drop increases the size of the continents; to test the reliability of our simulation, we compared our results to those used in the Paleoclimate Model Intercomparison Programme (joussaume and Taylor, 1995) and calculated by Peltier (1994, 1996). Most of our simulated values for the LGM are smaller than the Peltier ones. However, the difference between our results and the Peltier results, averaged over each continent, decreases when the sea level is allowed to change: for Greenland, it drops from 15 to 6%, for North America from 15 to 4%, for Eurasia from 21 to 4%, and for Antarctica from 11 to 8%. For the whole globe, our simulated sea level drop of about 100 m at the LGM leads to an increase of emerged continental surfaces of about 20 x 106 knr (13.7 in the Northern Hemisphere and 5.9 in the Southern Hemisphere). This is a 13% increase over the present-day value of 149 x 10'* km2. Figure 8,4 shows, for each 5 latitudinal belt, this variation of the land surfaces over each continent. The largest increase is situated around 72.5 N and corresponds to the Bering Strait and the North Sea closings. In the Tropics, the platforms associated with Indonesian coral reefs, the southern China Sea, and Southeast Asia are responsible for a secondary maximum just south of the equator. their contribution to the Northern Hemisphere ice volume variations (V) and of their synergism has been made for the whole last glacial-interglacial cycle. 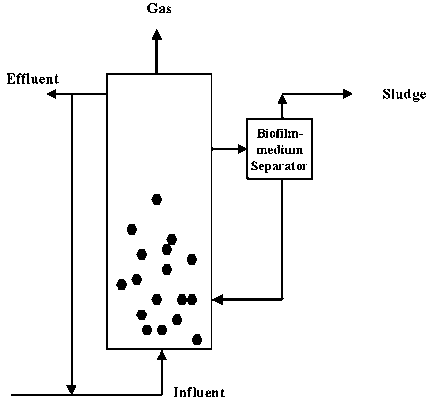 To isolate the respective contribution of the vegetation-snow albedo and of the sea level-ice volume feedbacks, the factor separation technique of Stein and Alpert (1993) was used. This method allows the identification of the contribution of the processes involved in a climate model as well as their synergistic effects. When applied to two processes, as in this chapter, this method requires four experiments to be made, in the first simulation, in, called the control experiment, both the sea level and the albedo of the vegetated area covered by snow are varied. In the reference experiment, ¿00, they are kept fixed. In the two others, only one factor is allowed to vary at a time (the VSAF in J io and the sea level in Vq\). From the Taylor expansion of any function V of two variables, the factor separation technique gives where J qo — If® is the value of V when none of the factors is active, and represent the pure contribution of, respectively, the first and the second factor, and V\\ gives the pure contribution of the interactions (synergism) between the two factors. When identified by the Taylor series expansion, this last term sums the contribution of all the partial derivatives of V w ith respect to both variables (second order and higher; Dutricuxct al, 1996).